You as urban pet parents have a very specific set of challenges and pet guardianship in NYC is a huge commitment. Founded in 2005, The Perfect Pooch NYC is a PROFESSIONAL and EXPERIENCED family-owned pet care company. Lead by a wife and husband team, we personally make sure our clients and their pets are cared for like they are an extension of our own family. We treat the care of your pet as we do our own because we know that the love of a pet is irreplaceable. We maintain a small team made up of honest, reliable and loving pet owners and animal enthusiasts. As pet sitters and dog walkers we take great care in being punctual, communicative and compassionate when it comes to caring for your pets. All team members are thoroughly screened and reference-checked, experienced in caring for all types of pets and breeds of dogs, and are carefully trained in basic safety and handling. We are pet people through and through and love spending our days taking care of animals. The Perfect Pooch NYC was created to bring a little love and balance into an otherwise topsy-turvy world. Founder Leeland Allen had lived in the city for five years, pursuing a career in the performing arts but the only peace she found every day was while walking dogs part time for one of Manhattan’s oldest walking agencies. Having grown up on a small farm in New Hampshire, surrounded by and working with animals of all sorts, Leeland not only had the experience needed to do the job, but it filled her with a much needed reminder of “home”. After her boss decided to dissolve the company , Leeland stayed on as walker for her regular clients and began to build what is now The Perfect Pooch NYC. In 2011 Leeland met Franco, an animal-crazy, native Brooklynite who wooed her with his Pekingese sidekick, Charlie. Three years later they were married and in 2016 they had a baby girl. Together they now run the company with their daughter, Esme, in tow. 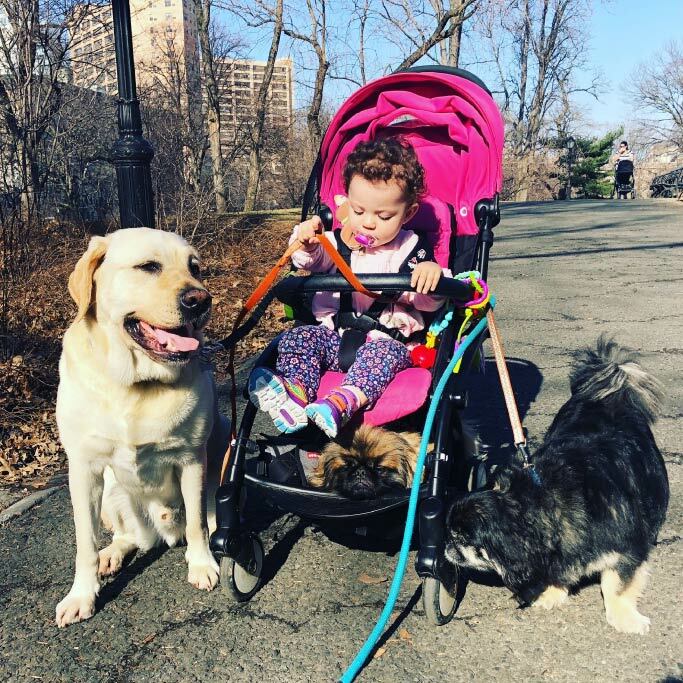 Known as The Walkers With the Hot Pink Stroller, Leeland and Franco view pet care as a labor of love and something they hope to one day pass on to their daughter.